George Bisso passed away Wednesday. Bisso was well-known in the Seattle area, according to friends at SBE-16. He was chief engineer for Sandusky’s Seattle cluster. He was also a contract engineer for many Pacific Northwest radio stations. Andy Skotdal, president and GM for KRKO(AM) new Bisso well and made use of his services often, including a major rebuild of the KRKO plant. Skotdal added: “George cared for 92.5 KLSY, 106.9 KRWM, 98.9 KWJZ, 880 KIXI, and 1150 KKNW [Sandusky stations]. When the NAB Radio Show came to Seattle, I spoke with two respected out-of-market engineers who were glad the show was in Seattle because they were eager to listen to the KIXI(AM) ‘sound.’ KIXI was arguably the best sounding AM on the West Coast, and at the time it was playing Sinatra, Tony Bennett, and mixing in music as late as the 70s. The bass was rich and powerful, and somehow George also managed to extract high notes with separation, all while maintaining loudness that was unmatched.” Skotdal attributed KIXI’s strong ratings to Bisso’s processing wizardry. 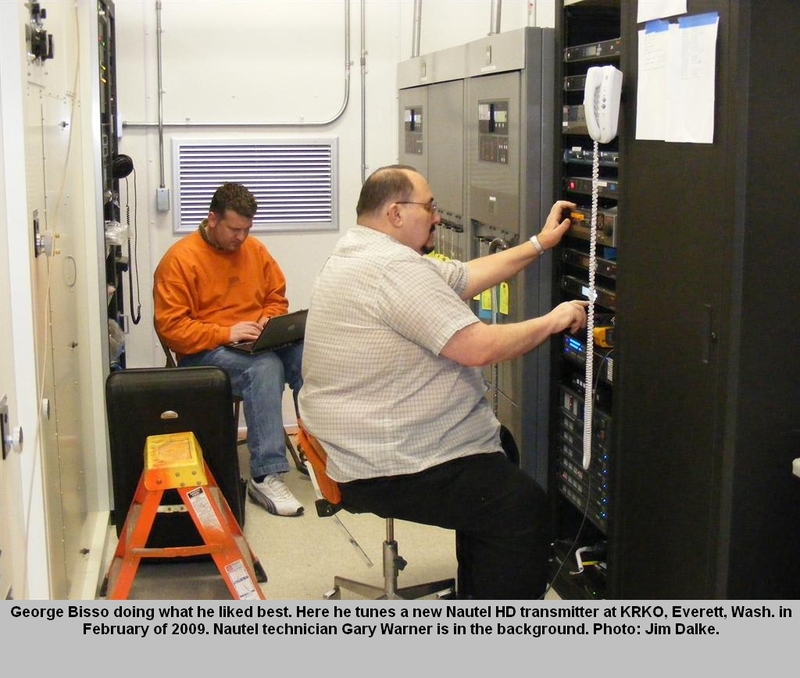 Bisso was also involved in a number of regional RF engineer and technical organizations. In addition, he was a ham radio operator, W7GLB. A memorium has been set up SBE-16’s website. It promises to provide services information. George Bisso W7GLB A Man Who Loved Radio George Bisso passed away on March 20, 2013. George’s life was radio, whether it was high powered AM and FM broadcast, coastal NWS transmitters or mountain top two-meter ham repeaters. We will keep George’s radio community informed on this website as arrangements are made for his remembrance.